Women on a Mission: Mom Edition: LEAP DAY: EATING OUT BAN! Recently, I read an article in my “All You” magazine (this magazine is stacked full of coupons, so consider buying it….plus there are always sales, deals, etc. so you can purchase a subscription for DIRT CHEAP!). In the article, the working mom decided to stay home with their kids and in order to cut costs they decided to cut eating out (which they typically did at least once a day). Steve and I find ourselves grabbing food on the go—it is so simple! After reading the article—I told Steve I am inspired! Let’s do it! He agreed, I agree, and we shook on it! Of course, we set some ground rules. The eating out ban would begin on Friday morning (or today). So far so good! Also, the only time we would “eat” out is if we had to be out of town (we of course could not schedule going out of town to eat). And if there were other issues that came up (like a lunch meeting out), we would discuss prior to the meeting as well as focus on healthy and affordable options. Both Steve and I know that this will cut down significantly on our spending, but it should also help to shrink the waistline, because to be honest…1996 bodies are not coming quick enough! ENOUGH WITH THAT! Aaron and Jen in Mexico--QUANTUM LEAP TRIP! HERE WE COME! 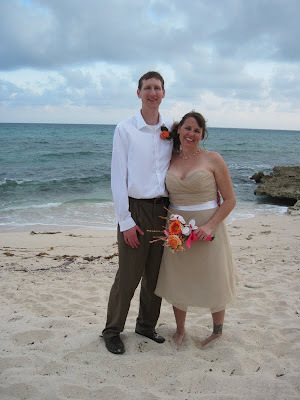 My husband Aaron and I have been married for 3 years, but we have lived together for almost 8 years. One of our earliest arguments as a cohabitating couple was the “what’s for dinner” debate. We would come home from a long day of classes and thesis/dissertation writing and have nothing but frozen chicken and pasta sauce in the fridge. I would offer up something to cook and Aaron would reject it, and so it went, every evening. I was fed up and we needed a solution to this constant argument (which is what it usually escalated into). 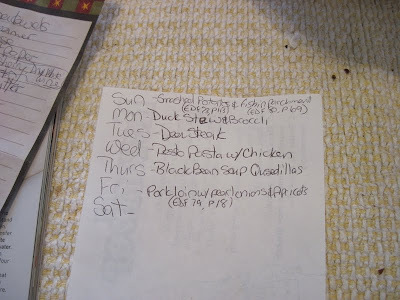 So we came up with a plan, we make a weekly dinner menu and stick to it. Every Sunday morning over breakfast we sit down with our cookbooks and put together a list of dinners for the week and our grocery list (Lori says: I of course am a couponer, so I would encourage you to meal plan around what’s in your stockpile or on sale). Doing this also helps us look at our schedules for the week, and plan who’s doing the cooking. It was a bit of a struggle at first. However, this simple solution turned our arguments into a once a week thing instead of an everyday thing. We truly enjoy this time together as a couple and we often find meals we can cook together, which is fun. Now, for the rest of the week we have a plan. We look at the menu every morning before we go to work to make sure we take what we need to out of the freezer to thaw in time for dinner. A menu example--I see some yummy meals! 1) Most importantly we don’t argue over what is for dinner. 2) It helps us make a thorough grocery list and we get everything we need for the week without having to make multiple trips to the store. 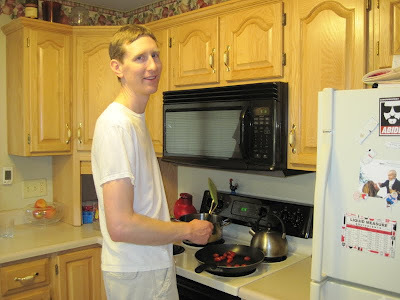 3) It helps us divide up the cooking so I’m not the only one doing it every night. 4) Keeps variety in the meals we cook. 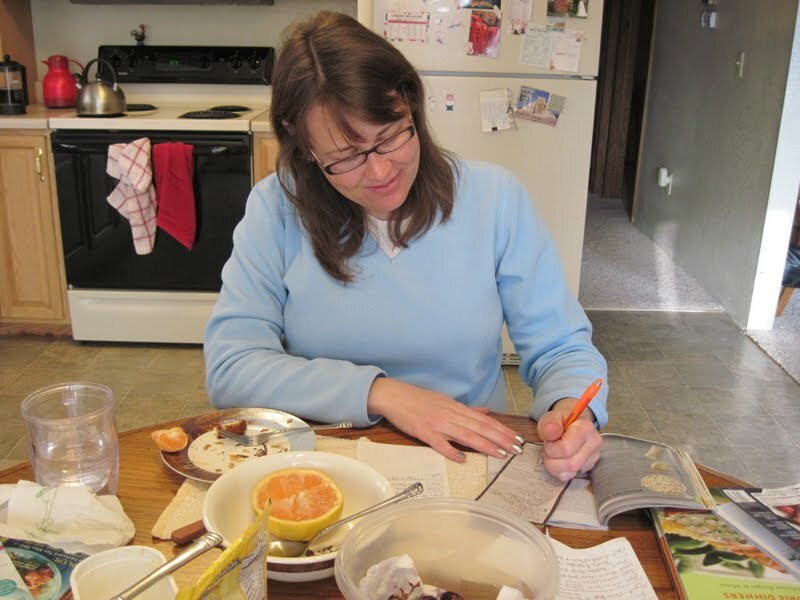 We have our staples, but we usually end up cooking at least one new recipe a week. 5) We assess what is in the fridge/freezer each week to make sure we only buy what we need and to ensure the food we already have doesn’t go to waste. 6) AND THIS WILL HELP LORI AND STEVE MEET THEIR QUANTUM LEAP GOAL OF NOT EATING OUT! “Everyday Food” – This magazine is part of Martha Stewart’s empire. 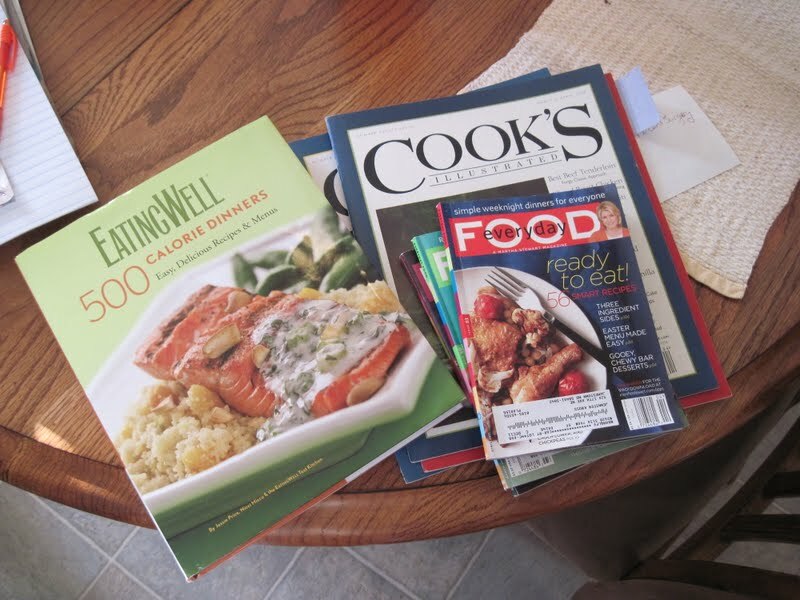 The recipes in this magazine range from quick 30 minute meals to longer hour plus cooking time. Most of the recipes are simple, quick and delicious. Not many exotic ingredients and lots of simple side dishes which is something we need help with because before we got this magazine we were eating a lot of plain old steamed green beans. “Green beans again!” Aaron would complain. “Eating Well, 500 Calorie Dinners” – This cookbook has lots of delicious healthy meals. We have found one big flop (Shrimp lime soup) that I actually ripped the page out of the book so I never attempt that recipe again. But all the other recipes that have come out of this book are part of our healthy staples. “Shape” Magazine – I have had a subscription to this popular magazine for a long time. A lot of the recipes they provide are healthier twists on traditional meals like burgers and tacos. It is a bit of a gamble with these recipes, some of them are real flops like the chickpea burgers I made last week. But we have also gotten some of our favorite staples from this magazine like black bean burgers and bulgur burgers with cucumber, feta and bulgur salad. We often refer to Foodnetwork.com for recipes that we see made on our favorite cooking shows like Alton Brown’s “Good Eats” (overnight cinnamon rolls to die for!). We also find good stuff on Cooks.com. But on that site there are often several versions of a single recipe and you need to read the reviews to see if it is any good or not. This weekly practice has made our home a more content place. However, soon we will face the challenge of incorporating meals for a little one into the mix. We’ll see how our routine changes when our baby arrives this summer. Thanks Jen for this fabulous plan. Its saves on time and stress! PS: check out your local library—remember they often sell old magazines for less than a quarter. Better yet, check out a new cookbook for FREE!